The black bin is for general waste that cannot be recycled in either the blue or brown bin. The Council encourages people to recycle as much as possible using the blue and brown bin recycling service. 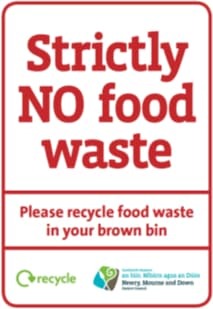 You must use your brown bin for food waste. In the future black bins found to contain food waste may not be collected. What can go in your black / general waste bin?